Just a hop, skip and a jump away from flower gardens, winding trails for cycling and jogging and ample green space for an afternoon BBQ after the mandatory volleyball game. 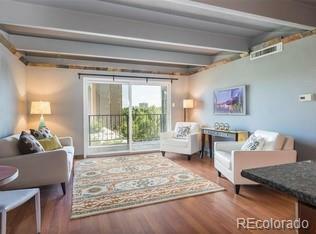 There's "living near Cheesman Park" and then there's "living just blocks north of Botanic Gardens, Congress Park and Cherry Creek"!Great set-up featuring two spacious bedrooms with tons of natural light, two full bathrooms, IN UNIT full size washer and dryer, plus a balcony with mountain views. Highlighted by hardwood floors, updated kitchen with granite countertops and stainless steel appliances. There is even room to store your beloved mountain bike. Excellent rental opportunity for investor or roommate situation. This building offers a remodeled workout room and business center. The HOA is reasonable. BEST MOVE QUICKLY!